Well it’s that time of year when I like to check out and photograph the unique shop windows in the quaint town of Lititz,Pa. This year the first one to catch my eye was the newly opened fiber arts destination with the catchy name of Ewebiquitous. I usually like to shoot horizontals but this one worked out in a vertical and features the exterior decorated window box and the sheep dressed in knitted Christmas stockings looking out the window. The owner had closed the shop for the day but graciously allowed me to come inside to light the yarn with some flash to highlight the colors. This entry was posted in Christmas, Landscape, Light Painting, light painting, Photography and tagged Christmas, Ewebiquitous, Glowing, lancaster county, Light Painting, lititz, Nostalgia, pa, Photography. Bookmark the permalink. Love your Lititz photos! The lighting off the new yarn shop photo is excellent. 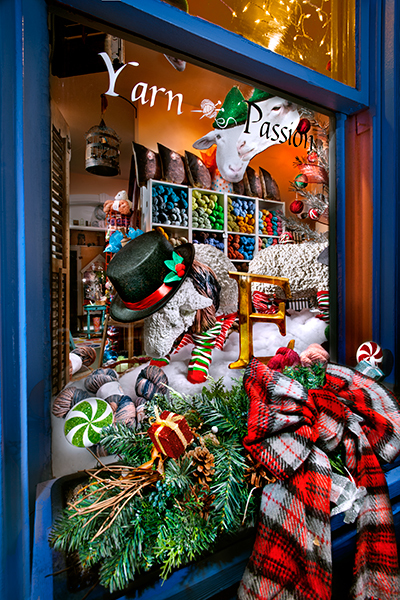 And it is such a fun shop inside to match the whimsical window decor. Additionally, the fall shots of the church square are just perfect! Thank you very much Maryann. I love capturing the beauty of Lititz whenever I can. It is so beautiful it reminds me of the some of the villages up north when we visited when I was a kid. Brings some good memories when both my parents was alive. Thank you Donald. Happy Holidays to you and yours. Glad I could spark the memories. This picture has a lot of vibrant colors.